Alaska’s oldest winery celebrates. A winery in Alaska?! Alaska’s oldest licensed winery isn’t old enough to drink, but it’s just the right age to serve. Alaskan Wilderness Wines, based on Shearwater Way in Kodiak, is turning 13 this year and proprietors Steve and Lisa Thomsen couldn’t be happier. “Wine, it gets better with age,” Steve said. Homemade fruit wine has a long tradition in Alaska and the state has had a licensing regulation for commercial wineries since at least 1993, but when the Thomsens began producing wine in 1999, they were the first in Alaska. Since then, they have been at the forefront of legislative efforts to expand the business, promoting legislation to allow wine through the mail and to allow dry communities to open wineries. 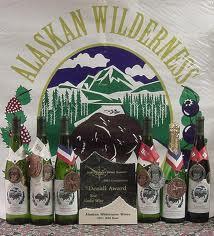 Alaskan Wilderness has also picked up more than a few national prizes for its wine. The most notable came in 2010, when the company won a gold medal at the Indy International Wine Competition for its wild blueberry wine. The competition is the largest in the United States, and “coming out with a gold there is a really big deal,” Steve said. Alaskan Wilderness remains the only winery in the state to have won an award from the Indy competition.